Big Swing Golf Underwood is the ultimate indoor golf and sports experience, conveniently located at The Zone, Compton Road, Underwood, we are open 7 days per week and it’s always 21 degrees! Golf Underwood is the ultimate indoor golf experience. Big Swing Golf Underwood runs a monthly competition... think (indoor cricket, bowling league, tennis) Its Fun Fast and SOCIAL. Played over 3 rounds, 4BBB, Ambrose, Foursomes.. week 4 the top 2 teams play off for a great prize and a spot in the Master of Masters event in December. Teams not in top 2 play a 'best of the rest' round in the last week and play off for a great prize of a one month frequent players membership (Value $99). Great weekly prizes and a different sponsor each month. $25 per player per round (will take about 2 hours) Your round can be played at any tme during the week. Bar is open from 10am... sledging starts at 5pm! Are you over jumping castles, magic clowns and face painting? Are you looking for something new and exciting for your next birthday party? Do you want your childs party to be the talk of the school? ... then we have the answer, and we guarantee your party will be an outstanding success. You can choose from golf (game on course or novelty options) or a variety of sports such as basketball, baseball, soccer, cricket, rugby, zombie dogeball and more. 90 minute or 2 hour packages available and the parties are perfect for kids aged 7 and over. Cost is $18pp for 90 minutes or $25pp for 2 hours (minimum 8 guests). Includes dedicated host, clubs, balls or sporting equipment. Optional extras catering, balloons and cake. *We are a licensed venue so adults can sit back and relax and chill out with a nice cold bevvy or 2. Call Naomi or Colin 3299 1300 for further details or to book your ultimate party. A Big Swing Golf FUNdraising drive will take your team to FUNdraising victory. We are proud to support local schools and sporting clubs and we have an offerto help raise funds for your club. Big Swing Golf Underwood will provide your school or club FREE access to our venue for 2 nights through the year. You decide how much to charge your guests to play and your club keeps the full amount. We organise the fun on the night, play golf, play arcade games (take out the cart guy or smash windows)... or play our Multi Sports options such as soccer, rugby, basketball, Zombie dodgeball, cricket... the possibilities are endless, but what we can guarantee is that you'll have an awesome night. Call Naomi or Colin 3299 1300 or email underwood@bigswinggolf.com.au to find out more. Are you looking for a FUN way to reward your team, do some team building, or host an end of finacial year celebration, Christmas party? Do you want to take your clients out for a networking session or thank them for their support?... Then we are the ultimate destination. We can host your function and ensure your team will have and fun and enjoy something different. Golf (Real or Fun), arcade games... hit the cart guy, chip poker, targets, long drive challenge... the possibilities are endless. Functions can be tailored to your needs / budget. 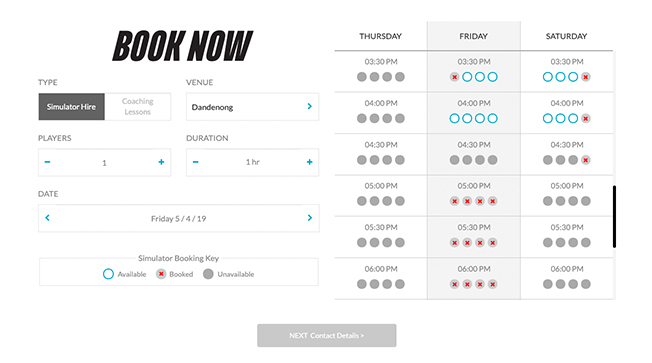 $35pp for 2 hours (min 8 players) includes 2 hours sim hire and 2 free drinks and dedicated host. Heaps of catering options are available at an additional cost from Pizza to Epicure Finger food. Talk to us and we'll work out the best option for you. Just think of us as your personal PA.
OK... so its day 4 of the school holidays and you've exhausted all the options for keeping the kids entertained and you're wondering what to do with the little munchkins for the rest of the break! Well... do we have the answer for you. Play Monday - Friday 8.30 - 4pm. Kids play FREE with a paying adult or put the kidlets in a sim on their own and play half price. Thats a great deal and adults can enjoy a cold bevvy or 3 from the bar whilst supervising. Here's what one of our patrons recently said about their experience... "Great time for any age group. All staff really helpful. Thanks. We'll visit again soon". Are you over being the looser in your group?, Do the boys constantly take the 'mickey'?, Does your slice rival Manus' best recipe? or do you just want to improve your game? Well, we have a secret weapon... Coach Jay will fix you up in no time. Why not book a cheeky lesson or 3 (package option) and have Coach Jay sort out your game? You'll be taking the money off the boys in no time a nd your secret is safe with us... we wont say a word. Jay is one of the leading instructors in Queensland, being nominated for Teaching Professional of the Year in 2015 & 16. Jay is a certified Australian PGA Professional, advanced in game development and coaching and is a National All Abilities. Jay’s passion is to build the next generation of golfers, a passion so strong he created a business solely concentrating on getting kids to play. Jay engages participants through programs designed to kick start a lifelong love of the game of golf. The programs teach male & females of all ages & abilities the basic fundamentals. Jay also enjoys and has had great success with a number of high-performance players, golf club members and elite juniors. He will work with you to design a plan to improve your game.